I haven’t been sleeping well these last six months or so – and I won’t need to tell readers of my blog why that is. I don’t usually have a problem getting to sleep, but I often find myself awake at four or five am. That is when audiobooks are such a godsend. I prefer books that I already know – doesn’t much matter then if I drop off and miss a bit – and I prefer them unabridged. And of course it is of paramount importance that the voice is right for that particular novel. I’ve been enjoying the work of four wonderful actors. It goes without saying that David Suchet is perfect for Murder on the Orient Express, but Hugh Fraser is pretty damn good as a reader of other Christie novels, such as The Hollow and Nemesis. Ian Carmichael couldn’t be better in the dramatisations of Dorothy L. Sayers’s Wimsey books, reprising the role he played so well on TV. 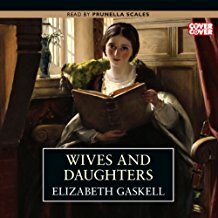 But the absolute queen of the audiobook is for me Prunella Scales, first with Mrs Gaskell’s Cranford, and then with Wives and Daughters. This last in particular has just been sheer bliss and toward the end I was listening to it even when I didn’t have insomnia. Her characterisation is so perfect, her understanding of the nuances of the novel so complete – and what a marvellous novel it is, full of insight into human weakness, but full of compassion too. I could listen to her forever. If there are other listeners to audiobooks out there, I would really welcome suggestions for other good readers – particularly of the classics or of golden age crime fiction. Please let me know your favourites. I know they are a bit frivolous… but there are some nice readings of Georgette Heyer’s out there …. they were my Mother’s salvation …. Thanks, Helen. Were those the romances (not really my cup of tea) or the mysteries? I love audio books & always have one on the go. I have the two Gaskells you mention read by Prunella Scales in my Audible library. I can recommend so many narrators. David Timson is a favourite. He did a wonderful job with Dombey and Son as well as Gibbon’s Decline & Fall (6 vols, over 100 hours. I’m only up to the 3rd part but enjoying it very much). He also read all the Sherlock Holmes stories & Wuthering Heights with Janet McTeer (he’s Lockwood, she’s Nelly Dean). Nathaniel Parker reading Far From the Madding Crowd, Harriet Walter reading Olivia Manning’s Balkan Trilogy & Barbara Vine’s Asta’s Book. Juliet Stevenson is another favourite, she reads so beautifully. I loved her reading of North and South by Gaskell and she’s also done lots of Jane Austen. Also Christian Rodska reading Evelyn Waugh’s Sword of Honour trilogy, Jeremy Sinden or Jonathan Cecil reading Wodehouse & Patricia Hodge reading Love in a Cold Climate for something 20th century. I also loved Nigel Davenport’s reading of My Family & Other Animals. I loved the Ian Carmichael Winseys, what a shame they’re no longer available. I do have the CDs of Gaudy Night which I bought from Amazon but the others aren’t available. There are BBC Radio versions but I prefer unabridged whenever possible. I enjoyed Edward Petherbridge’s reading of the Jill Paton Walsh Wimsey continuations. So many of my favourites that I listened to on cassette, then CD, have been rerecorded with other narrators but it’s not the same. I enjoyed Bill Wallis reading the Ruth Dudley Edwards mysteries, Cornelius Garrett reading Anne Perry’s WWI series (he’s also very good at Georgette Heyer). James Saxon has read lots of the Ngaio Marsh books. I’ve heard good things about the Hugh Fraser Christies, I must try one. Sorry, I’ve gone on a bit! One last recommendation (two, really). If you’re a le Carre fan, his own reading of The Pigeon Tunnel is great. Also, Frederick Forsyth’s memoir, The Outsider, read by Robert Powell. I hadn’t read any Forsyth novels but am halfway through The Odessa File, read by David Rintoul, which I’m really enjoying. Must listen to Day of the Jackal next. Thanks so much, Lyn. There is enough to keep me going for years here. Great to feel that I won’t be at a loss when I next want to download a good read. Juliet Stevenson particularly appeals. I was thinking of that great novel, Howard’s End, the other day (I did it for A Level) so this is a particularly interesting suggestion. Thank you, Diana. Might try the Miss Silver novels too. I can’t help with audiobooks, but oh Wives and Daughters! I am forever wondering what my top 10 favourite novels would be, and changing my mind, but for more than 30 years there has been no doubt that W&D is one of them. It was the R4 classic serial back in the 80s, and I picked up the book because of that, and have re-read it every couple of years since. I love much by Brontes, Austen, Dickens, Trollope – but this one is, I think, my all-time favourite Victorian novel. It has that combination of a wide range, a clear eye, and a huge compassion. She sees everyone’s faults, but she is kind. Andrew Davies did a TV version a while back, which I liked, and his comment on the book was ‘it teaches us how to live.’ I would find it hard to say why and how, but inside myself I know exactly what he means and agree. It’s possible Andrew Davies said something more like ‘it teaches us what it means to be alive’ which is even better! Equally hard to defend rigorously – but equally satisfying. I would have put good money on your loving Wives and Daughters! She is so very good on parent child relationships and you see exactly why Cynthia turned out as she did. It is a favourite novel of mine. What an interesting comment by Andrew Davies – there are actually passages that I remember as kind of moral touchstones and that have stayed with me. Perhaps we could do desert island books sometime? The absolute best marriage of reader and audiobook I’ve come across is Harriet Walters and Lady Susan. Walters just IS Lady Susan. Like you, I love the Carmichael Wimseys but I also very much enjoy the Petherbridge ones and actually prefer him in the television dramatisations. That sound perfect – and I haven’t read it. Definitely one for the list. Thank you. I recently listened to an Alexander McCall Smith book read by David Rintoul it was one of the Bertie books and his reading was so dry, so funny, that I laughed out loud. On googling David Rintoul, I discovered that he had once played Darcy in Pride and Prejudice – I would love to have seen him. At the moment I’m listening to The Portrait of a Lady by Henry James read by John Wood and I’m finding it very good. I know the book very well so it doesn’t matter if I fall asleep. Thank you, Sue. I can imagine that Timothy West would be splendid reading Trollope, a writer I love. And Portrait of a Lady is one of my favourite novels. Like you I know it so well that it would be ideal night-time reading. A middle school librarian friend of mine recommended The War That Saved My Life, written by Kimberly Brubaker Bradley and read perfectly by Jayne Entwhistle. This isn’t an adult novel but I found it very enjoyable to listen to when knitting, and I do recommend it highly. Thanks so much, Naomi. Another one for the list. I don’t care about categories. If something is good, it doesn’t matter.